American Primitive is a poetry collection by Mary Oliver. The fifty poems in "American Primitive" make up a body of luminous unity. Mary Oliver's visionary poems enunciate the renewals of nature and the renewals of humanity in love, in oneness with the natural, in union with the things of this world. Lyrical and elegiac, Mary Oliver celebrates the primitiave things of America - the wilderness that survives both within our bodies and outside - in . "..the cords/ of my body stretching/ and singing in the/ heaven of appetite." When I got back into poetry last year, I turned to some of Mary Oliver's non-fiction books to learn more about poetry. In the process, I wound up learning about myself and reasons why I've always had a connection to poetry. The poems in Oliver's non-fiction books were written by other poets. 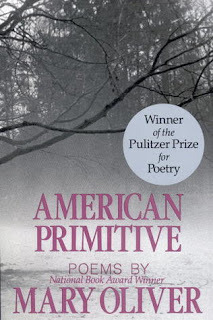 I wanted to read some of Oliver's poetry so I purchased a copy of American Primitive. I was saddened to learn of Mary Oliver passing a couple of weeks ago. As we tend to do when we lose an artist, I spent time getting to know her poetry in American Primitive. I loved Oliver's take on the wilderness that exists in nature as well as within ourselves. Oliver won the Pulitzer Prize for Poetry for American Primitive. This was a great choice for experiencing her work. I hope to hunt down many more of her collections in the future. I don't really read much poetry but I'm glad you liked this one. Sounds like the world lost a really good poet. She was a very passionate lady. Sounds like some lovely poetry. I am not a avid reader of it. But, when in passing have read some have liked it. I am glad you liked the book.